Early bird registration ends October 31st, 2009—your chance to save $150. Social engineering methods of research were introduced to in the 1970s to complement scientific methods for knowledge generation and program evaluation. These methods use the procedures and logic of industrial R&D (research and development) to turn basic scientific discoveries into usable products. Rothman and Thomas at the University of Michigan School of Social Work are best known for both their individual and combined efforts to develop social R&D and D&D (design and development) methods for social work and other professions interested in social engineering methods. Their primary interest was in the question of whether “it was possible to develop R&D procedures for social intervention and thus to solve both the problem of ineffective methods and the problem of dissemination and utilization . . .” (Kirk and Reid, 2002: 23). Even though social R&D has been available since the 1980s, social work researchers have continued to invest almost exclusively in basic research to generate knowledge, and program research to evaluate service delivery innovations. Consequently, it is apparent that in spite of their anticipated promise, “they [social engineering methods] have not enjoyed the success of industrial R&D” (p. 24). In their recent book, Science and Social Work: A critical appraisal, Kirk and Reid indicate, “a major obstacle to extensive use of R&D approaches is the expense and time required to carry them out”(109). They also state that funding is often difficult to obtain and for those in academia “pressures from university administrators for faculty to engage in externally funded research and time constraints in meeting proposal deadlines are additional obstacles to use of R&D” (p. 109). Although social R&D and D&D methods have not lived up to their promise, there are some well-developed examples of how they might work. Rothman is noted for his development of the social R&D method (1980, 1986) and his applications of the method related to community practice interventions for homeless and runaway youths (1989) and case management (1994). These efforts and others that are identified in social work literature have yet to demonstrate substantial success in the fourth and final diffusion phase of social R&D. A suicide intervention-training program, developed by Professors Richard Ramsay (Social Work) and Bryan Tanney (Medicine) and their UofC alumni colleagues, Roger Tierney and William Lang is a major exception to the limited success of cited R&D innovations. The program includes a 2-day ASIST (Applied Suicide Intervention Skills Training) workshop and a 5-day T4T (Training for Trainers) course and a quality control system for workshop dissemination. Conducted as an informal partnership from 1983 to 1991, the group established a credible performance record in Canada, the state of California and the U.S. Army (V Corps) in Germany. During this period, their work received two export achievement awards from the Alberta Economic Development Authority (1987) and the University of Calgary (1988). A third export award was received in 1997 from the Calgary Economic Development Authority. Their film work produced by the University of Calgary had also received 8 film and video festival awards, including a Gold Medal at the New York Film Festival (1987), and Best Actor and Best Actress awards at AMPIA (Alberta Motion Picture Industry Awards) in the same year. In 1991, the group became a start-up company of the UofC’s newly formed venture company, University Technologies International, Inc. (UTI). It is now the most widely disseminated suicide prevention program in the world. UTI made a $50,000 non-repayable investment to establish LivingWorks Education, Inc. as one of its early start-up ventures in the soft-sciences in return for an 11-year royalty payment agreement tied to the number of participants attending ASIST workshops. They also assisted LivingWorks in getting a $75,000 technology transfer grant from the Alberta Heritage Medical Research Fund (AHMRF). The LivingWorks program through its large network of local trainers is now disseminated nation-wide in Australia, Canada and Norway. Its work is statewide and countywide in several regions of the United States, system-wide in the U.S. Army, and command-specific in the U.S. Air Force. Smaller numbers of certified trainers are also seeded in Guam, Hong Kong, Northern Ireland, Russia, Scotland (Shetland Islands), and Singapore. LivingWorks began its work with the U.S. Army in Germany in 1989 following a partner’s (Ramsay) visit to several military groups and presentation of the keynote address at a military social work conference in Vienna. In 1991, their initial success was rewarded by a special invitation to provide bereavement and grief training for the Army in Frankfurt during the Desert Storm Operation. In 2000, through a second special invitation, the group had the honor of joining with the Menninger Leadership Centre, part of the highly respected Menninger Clinic, to provide a bi-annual, week long suicide prevention training program for all Army Chaplains and Chaplain Assistants. In 2001, the Army completed a major revision of their suicide prevention campaign and named LivingWorks as their primary training provider for all their military installations around the world. In 2002, LivingWorks partnered with the Applied Physics Laboratory at Johns Hopkins University to provide the U.S. Department of Defense with a Virtual Counseling Simulation Training (VCST) CD-ROM program as a post-ASIST continuing skill development package. This support program will be released in 2003. Similar system wide dissemination of the ASIST program is underway with the U.S. Air Force and in the beginning stages with the U.S. Coast Guard. In 1995, Lifeline Australia received a major community development grant from the Commonwealth Government’s Department of Health and Family Services to partner with LivingWorks in conducting a 3-year Suicide Intervention Field Trials Australia (SIFTA) project. The success of the field trial project evolved into LivingWorks Australia and nation-wide dissemination of ASIST in continued partnership with Lifeline Australia. Australia trained their 10,000 ASIST participant in 2001. In 1999, ASIST was introduced in Norway. The program now operates under the name Vivat is an official part of the Norwegian national strategy to prevent suicide. As a side part of their social R&D work, Professors Ramsay and Tanney at the request of the United Nations were instrumental in the development of a UN/WHO Guideline for the formulation and implementation of national strategies for suicide prevention. They raised the funds, organized and hosted the first Interregional Experts Meeting on suicide prevention of 15 participants from 12 countries at the University of Calgary and Banff Centre in 1993 (Ramsay and Tanney, 1996). The Prevention of Suicide guideline, officially published by the United Nations in 1996, is now recognized as an influential document on the development of national strategies in several countries around the world (Taylor, Kingdom and Jenkins, 1997; Jenkins and Singh, 2000). Dr. David Satcher, Surgeon General of the United States, specifically acknowledged the significant role that the UN guideline played in the recently completed U.S. National Strategy for Prevention of Suicide (Satcher, 2001). Ramsay documents the impact of the UN/WHO policy strategy guideline on the U.S. national strategy, dating back to 1987, in a paper presented to the American Association of Suicidology (Ramsay, 2001). 1. Can a standardized core curriculum be designed for a diverse group of gatekeepers? 2. Can a standardized curriculum be delivered on a large-scale basis? 3. Can quality control standards be maintained with a diverse group of trainers? Stage two was also completed before the model was adopted. The preliminary design of the suicide intervention program came out of Ramsay and Tanney’s volunteer work with the Canadian Mental Health Association in Calgary, beginning in 1979. Alberta’s Suicide Prevention Provincial Advisory Committee (SPPAC) accepted the proposed design in 1982. The existing knowledge pool was converted into a core intervention curriculum and a province-wide delivery strategy was drafted between 1981 and 1983. A prototype of the curriculum was pilot tested twice in 1982; once with a large group of community caregivers (120) in northern Alberta, and second with a small group of professional counsellors and support staff in an urban community college setting. A survey in 1982 to determine province wide interest in becoming curriculum instructors identified a list of 300 potential trainers. A screening method was developed to select the first 80 to be trained in two Training for Trainers (T4T) pilot test courses in 1983. The first part of the Development stage overlapped with the second stage as main field trials of the intervention curriculum were tested throughout 1983 in a combination of 8 settings and locations: two rural, two institutions (youth and adult), and four urban locations. A further set of field trials was conducted in 1984 with Canada’s federal penitentiary system. Revisions to the original curriculum, preliminary instruction manuals, audiovisual materials and participant handout documents were tested in this stage. The Rothman model was formally adopted in 1984 during the second part of this stage. This part of the development stage saw the production of professionally packaged training materials in user-friendly forms, finalization of the curriculum with core content and flexibility provisions to accommodate customized delivery in different environments and cultural contexts. The procedure to regularly review and return to this stage for upgrading and improvements was embedded in the R&D process. The Diffusion phase was officially declared in 1985 with intervention workshops delivered throughout Alberta. Out-of-province diffusion had started the year before with demonstration workshops in Moncton, New Brunswick for the Atlantic Region of Corrections Services Canada (CSC). By 1985, CSC had adopted the training for all regions in the country. The partnership with CSC continues to function. Since then, the program has expanded to all provinces in the country with English and French language materials and presenters to support its dissemination. Out-of-country diffusion started in 1986 with the California Department of Mental Health’s Youth Suicide Prevention Program. 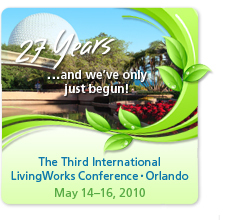 On the strength of a recommendation from Dr. Norman Farberow (one of the world’s most eminent suicide authorities), LivingWorks was awarded a first-time out-of-state, out-of-country, single bid, three-year, $100k per year contract to distribute their intervention training program in all 58 counties of the state. The success of this export activity was rewarded with one-year extensions and funding for seven consecutive years up until 1996. The diffusion phase was now more widely distributed than any other known social R&D program. It has since expanded on a statewide basis to Washington, Virginia, Colorado, Oregon and Tennessee and on a region or countywide basis to Oklahoma and Texas, and on a military basis to the entire U.S. Army and four of the five Commands of the U.S. Air Force. Not counting work with the U.S. Army in Germany, the first off-continent diffusion occurred in 1996 in partnership with Lifeline Australia. This was a 3-year Commonwealth Government funded project that has since become nation-wide and operated by a spin-off LivingWorks Australia group. Expansion to a second continent occurred in 1999 through medical faculty members from Tromoso, Norway. Now operating under the name Vivat, all program materials have been translated or re-made to indigenise for distribution in Norway. Vivat is now working with colleagues in northern Russia, Lithuania and Denmark to seed the program in their respective countries. Program impact in terms of design efficacy and effectiveness, implementation trials, ability to be broadly delivered and locally relevant has been subjected to more than 15 independent evaluations, including two UofC doctoral dissertations, throughout all stages of the development process. The two most extensive evaluations were completed on the Australian and Washington projects (Turley and Tanney, 1998; Eggert, Karovsky and Pike, 1999). One community development project in a small rural-urban catchment area in Canada reported a substantial social impact on youth suicide deaths from 1-2 per year over several years to no deaths over a 5-year period following the implementation of ASIST and other youth focused programs (Perry and Walsh, 2000). This kind of social impact is complemented by numerous anecdotal reports of personal impact, including the testimony of a BSW student in social work and mother of an adult son at the UofC, who had to use ASIST skills with her son. Police and hospital emergency personnel credited what she had learned and applied as probably saving her son’s life. In terms of longevity and practical sustainability, the work of Ramsay and Tanney and their colleagues has graduated 1800 local community trainers and approximately 900 of this number who are active presenters of the 2-day ASIST. These trainers have presented the program to over 300,000 community caregivers with the annual average now being close to 25,000 participant caregivers. The economic impact of this small start-up company has been substantial in its own way. The financial return to the University in 2001 was over $60,000. Total returns to UofC following its non-repayable investment of $50,000 will be close to $300,000 by the time the 11-year royalty payment agreement ends in 2002. The communications department of the University has produced three videos for LivingWorks, one of which is still the most awarded media production in UofC history. The videos have been consistent income generators for the University since 1983. A local printing company prints the materials for the program, including a 110-page Suicide Intervention Handbook. The Handbook, a best seller by any standard, is now in its eighth year and third edition. It has been distributed to over 100,000 ASIST participants as part of their workshop registration fee. The T4T program, which accommodates 24-30 candidate trainers, has grown from a start-up number of 3-4 courses per year to an average of 10-12 over several years that jumped to over 20 in 2001 and remained at that level in 2002. There is now a 20-member coaching trainer group available to work in teams of 3-4 who are strategically located in all of the company’s distribution regions around the world. LivingWorks, in addition to its five owner-developers, now employs one full-time program manager, several part-time employees, and provides numerous trainers with part-time income opportunities from their workshop presentations and Training for Trainer teamwork. Boldt, M. (Chairman). (1976). Report of the Task Force on Suicides to the Minister of Social Services and Community Health. Edmonton, AB: Government of the Province of Alberta. CMHA. (1981). Task Force on Suicide Report. Calgary, AB: Canadian Mental Health Association (Alberta, South-Central Region). Eggert, L, Karovsky, P., Pike, K. (1999). Section III: Selective prevention - gatekeeper training and crisis services (61-78). The Washington State Youth Suicide Prevention Program: Pathways to enhancing community capacity in preventing youth suicidal behaviors, Final Report. Seattle, WA: University of Washington School of Nursing. Jenkins, R. and Singh, B. (2000). General population strategies of suicide prevention. In K, Hawton and K. van Heeringen (Eds. ), The International Handbook of Suicide and Attempted Stuicide (597-615). London: John Wiley and Sons, Ltd.
Kirk, S. and Reid, W. (2002). Science and Social Work: A critical appraisal. New York: Columbia University Press. Maris, R. (Chairman). (1973). Education and training in suicidology for the seventies. In H. Resnick and B. Hathorne (eds. ), Suicide Prevention in the Seventies (DHEW) Publication No. HSM 72-9054. Washington, DC: U.S. Government Printing Office. Perry, C. and Walsh, M. (2000). Youth based prevention strategies in a rural community, Quesnel. BC: A community suicide prevention study. Paper presented to Canadian Association of Suicide Prevention 11th Annual Conference, October 11-14, 2001, Vancouver, BC. Ramsay, R. (2001). United Nations impact on the United States National Suicide Prevention Strategy (NSPS). Paper presented to American Association of Suicidology, 34th Annual Conference, Atlanta, GA, April 18-21, 2001. Ramsay, R. and Tanney, B. (1996). Global Trends in Suicide Prevention: Toward the development of national strategies for suicide prevention. Mumbai: Tata Institute of Social Sciences. Rothman, J. (1980). Social R&D: Research and development in the human services. . Englewood Cliffs, NJ: Prentice-Hall. Rothman, J. (1986). Supplying the missing link: R&D and its application to the human services. UCLA Social Welfare, 2(1), 4-9. Rothman, J. (1989, March). Intervention research: Application to runaways and homeless youth. Social Work Research and Abstracts, 13-18. Rothman, J. (1994). Practice with Highly Vulnerable Clients: Case management and community based service. Englewood Cliffs, NJ: Prentice-Hall. Satcher, D. (2001). Preface from the Surgeon General. National Strategy for Suicide Prevention:Goals and Objectives for Action (1-2). Rockville, MD: U.S. Department of Health and Human Services, Public Health Service. Taylor, S., Kingdom, D., Jenkins, R. (1997). How are nations trying to prevent suicide? An analysis of national suicide prevention strategies. Acta Psychiatrica Scandinavica, 95, 457-463.